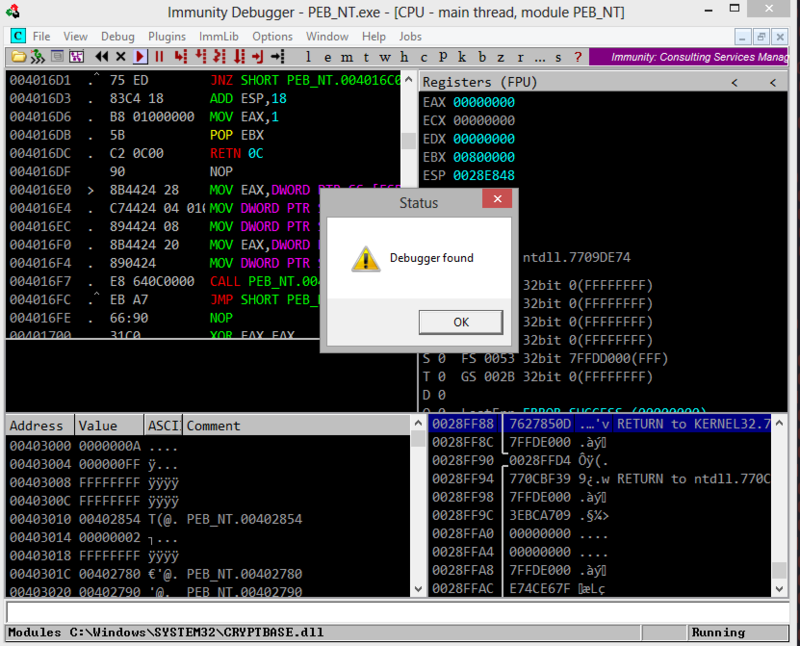 This is another simple anti-reversing trick used to detect a debugger. As I have shown earlier in my post about the TEB structure and the PEB structure, NtGlobalFlag is located in the PEB Structure at offset PEB+104. When the process is being debugged the NtGlobalFlag is set to 0x70. If we examine the API in a debugger we can see that it uses FS segment register which is the linear address of Process Environment Block (PEB) and then reach the offset 0x68 which is the NtGlobalFlag. Here’s a simple implementation of this in FASM. ;        using the PEB's NtGlobalFlag. Here’s another way coded in C in which we first take the address of the PEB structure and then get the address to the NtGlobalFlag using “ZwQueryInformationProcess” kernel mode API. 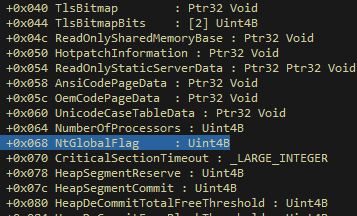 * then we check the NtGlobalFlag to determine the process is being debugged or not. In 64-bit systems the implementation would be as follow. Thanks to b3mb4m for mentioning in the comments. The NtGlobalFlag is located at PEB+0xbc. When the process is being debugged the value is 0x70 as usual. The assembly implementation would be like this. Here’s an simple example using inline assembly. * 64-bit implementation for NtGlobalFlag using inline asm. 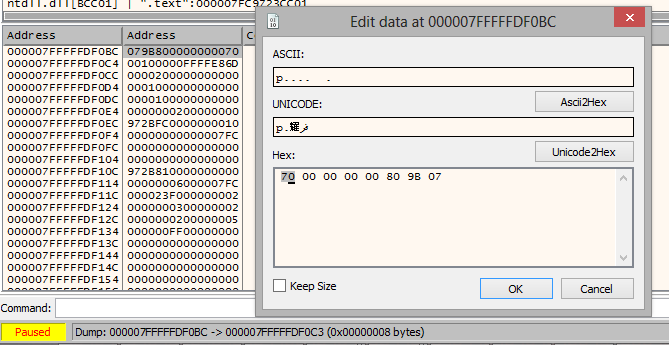 "mov rbx, qword ptr gs:[0x60];"
"mov eax, dword ptr [rbx + 0xbc];"
I did try same thing with inline assembly before, but there has little differents between 32bit and 64bit operation systems. Yes thanks 🙂 I checked your code. But it seems to be wrong. You move the wrong segment register. In 64 bit it’s gs:[0x60] and it should be a qword, mov rbx, qword ptr gs:[0x60]. Also notice you move the value into ebx and then you move [eax+0x10bc] into al, actually it should be mov eax, dword ptr [rbx + 0xbc].